WINDROSE is a vector diagram, illustrative drawing, which characterizes the regime of winds in a certain area for a certain period. It helps when planning the construction of houses and urban development, and often determines the well-being of certain urban areas. The wind rose can be a month or a few days. Pencil, piece of paper in the box, the table data of wind direction from any meteorite. Start compiling a wind rose is with the coordinate axes. In this case, however, they are not 2, as usual, and 8: on all sides and combinations. From the center of coordinates need to put the axis in all directions horizontally, vertically and diagonally at an angle of 45 degrees. Sign axis as Yu (South), (North), W (West), (East), and SE (Southeast), SW (southwest), NW (Northwest) and SW (North-East). Now you can start to build roses. Write the number of observations of wind over a certain period in a certain area, for example, 20 days in Moscow. These data are easy to take on any weather website. The results should look like: 1st day of observation – the direction of NW, 2nd NW, 3rd–, etc. until the last day of measurements. The easiest way to write data in two-line table. Group results for the wind directions. For example, it appears that for 20 days, wind direction North-West (NW) in Moscow was 7 days, West (H) – 4 days, etc. Should be 8 digits on the number of directions, some of which may be 0 if the wind direction during the selected period was never. The sum of all digits should be equal to the number of days of measurements. Check - if not, you then thought wrong. Now start the build. To do this, select and label on each axis a single cut. Now for each axis need to postpone counted the number of days the wind of the given direction, for example SW – 3, th – 5 units., etc. 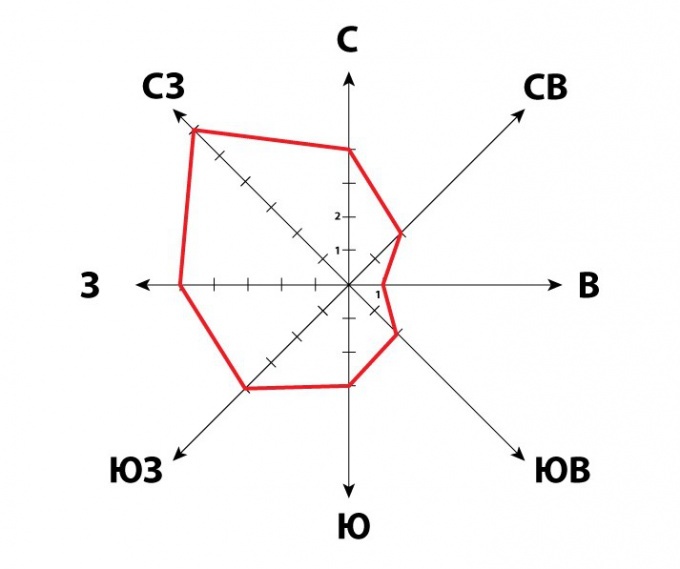 After all the points for 8 axes postponed, simply connect them by line segments to obtain a closed polygonal contour. The resulting ratnabali flower with sharp beams will be similar to the rose – this is rose of the winds for a given location over a selected period. It should be noted that each region has a typical monthly and seasonal wind roses, which largely characterize the climate of the area. A wind rose is called a circular vector diagram showing the direction of wind motion within a certain period. Such graphs are widely used in meteorology, climatology and also in the construction of runways, airfields, housing estates and industrial zones. Stylized image of a wind rose is often used in heraldry. Today it can be seen in the symbolism of NATO or old geographical maps. But unlike these diagrams, a stylized image all rays of equal length. For training purposes the wind rose often study the lessons of local history and geography, as well as in building universities and colleges. To build a simple wind rose for a specific location is not difficult. This task is often performed by pupils of 6-9 classes. In order to construct the wind rose will need the data of daily wind direction for month or more. This information can be obtained independently through daily weather observations, and you can also take in "Calendar of weather during the study period. Then draw a chart to organize your observations. To do this, draw a coordinate system in which the principal axis will reflect the four main directions – North, East, South and West. Then, using the center coordinate further two axes and mark them intermediate directions: northeast, Southeast, Northwest and southwest. On each axis, put the uniform division, symbolizing the conditional number of days. If you are considering a monthly period intervals of the coordinates can reflect one day. After you have completed the preparation work you can go directly to the construction of the wind rose. To do this, count the number of days during which the wind blew in a certain direction, and place them on each of the axes. The number of days each direction dot. Then carefully connect the resulting points with straight lines to make a closed polygon. The number of windless days (calm) mark in the circle the center of the diagram. If during the studied period of time in some of the areas of the world there was no wind, the connector in it should be interrupted. The result you will get a wind rose for your area during the study period. Its rays will be unequal, and the longest of them will show the prevailing direction of winds in the study area. 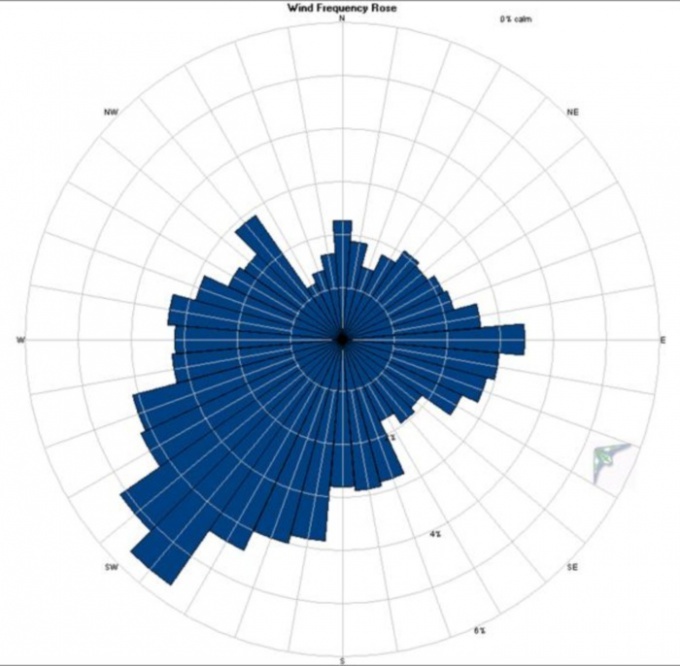 To graph a wind rose is possible and the automatic way in Excel. To do this, create a file in which record in the table the available data on the number of days and the wind direction. Should have two columns: names and areas of the world with the number of windy days. Then in the menu "Insert" - "Chart" select the "Radar chart" and follow the advice of master chart. The result is a graphic image of a wind rose. Rose of the winds is a vector diagram, which characterizes the wind regime in a particular area, the result of long-term observations. It looks like a polygon, the lengths of the rays which diverge in different directions and which are proportional to the frequency of winds from these directions. It is often used by builders in the planning of communities, runways of airfields, the solution of many agronomic and environmental problems. The first written mention of the rose of the winds belong to the XII century Is a vector diagram describing the wind regime in a given place for long-term observations. The real rose of the winds, built on the basis of the number of observations may have significant differences of the lengths of different rays. It was widely used by builders, sailors of long ago. Today, almost every student draws a rose on a lesson of geography for educational purposes, but often it is used when building a house, parachute jumps or other practical problems. Draw in notebooks intersecting lines showing main and intermediate sides of the horizon. Sign the names of the parties to the horizon. For this purpose, both Russian and international oboznacheniya: North (Nord) - S/N, North-East (Nord-OST) NE/NE, the East (OST) - B/E, South-East (Zuid-Oost) - SE/SE, South (Zuid) - u/S, South-West (South-West), SW/SW, the West (West) - S/W, North-West (Nord-vest) - NW/NW. Schedule should be similar to a coordinate system with additional diagonals for intermediate directions of the eight rays. (1 cell (0.5 cm) — 1 day) number of days during which the prevailing wind of a particular direction. For example, a month the North wind direction blew 3 times, that is, from the center of the graph by a line pointing to the North, you need to set aside 3 boxes and call it a day. Repeat this action for all directions. Mark these dots of bright color. The resulting points of the winds in the neighboring areas connect line. It is better to use colored pasta. In the middle of the graph and label the number of windless days. The rose of the winds you will be able to determine the prevailing winds in your city or region. To obtain reliable data required long-term monitoring of winds. 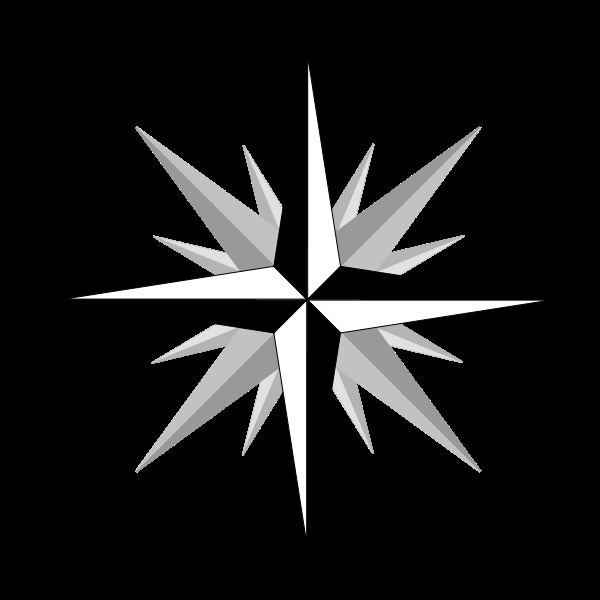 Also the wind rose in heraldry is called a symbol in the form of a stylized star. He used the emblems of various organizations: NATO (four beam), CIA (16 rays), the Ministry of emergency situations and the Ministry of transport of the Russian Federation (8 rays), as well as on the arms of the city etc. Rose of the winds is a circular vector diagram that shows the frequency of occurrence of wind in different directions for a certain period of time. Built rose of the winds are usually on the average long-term data for year, season, month. In order to draw the rose of the winds, you will need the data of daily wind direction for some time. For example, you can observe the weather for one month, recording daily information about wind direction in the weather Calendar". Draw on a sheet of paper intersecting lines (according to the principle coordinate system), which will specify the principal directions, otherwise they are called Rumba horizon (North–South, West–East). Then swipe through the center of the two lines (North-West, South-West, North-East, South-East). All you should have eight directions (compass points). Sign their names on your drawing (S; u; W; V; s-Z; s-V; SW; se ). Using data from "Calendar, weather", in each direction from the center in the direction where the wind blows, check the scale of the number of days during which the prevailing wind is a certain direction. You can choose any convenient scale, e.g. 1 day to take 0.5 cm If, for example, wind South-West blew in a month 5 days it is required from the centre of the graph by a line, which is oriented to the South-West, to defer 2.5 cm and make a mark. In the same way mark winds on each of the eight directions. Of the mark consistently connect straight lines. In the center of a rose of winds near or specify the number of days with calm weather. Ray rose of the winds you can make a conclusion about the prevailing winds in your area during the month. Wind direction is the direction (point) of the horizon, where the wind blows. Accordingly, the South wind always blows to the North, West to East, South-West to North-East, etc. In meteorology, wind direction is determined by 8 or 16 rhumbs. The first written mention of the rose of the winds belong to the TWELFTH century. Graphs of the wind rose in mandatory are made when designing construction projects to account for the effects of the prevailing winds in a particular region in the construction of housing, objects socially-cultural appointment and industry. It is believed that the rose of the winds was invented by sailors who needed to know the particular weather conditions for navigation. This information helped to understand when it is better to start swimming, to the wind was favorable. The diagram in the form of a rose and is now used in the design and construction. Observations about wind direction in the studied period of time, paper, pencil, ruler, eraser. Draw two axes. Meteorologists keep records for 8 or 16 rhumbs. Depending on how detailed were the observations for wind direction, draw two, or six axes. 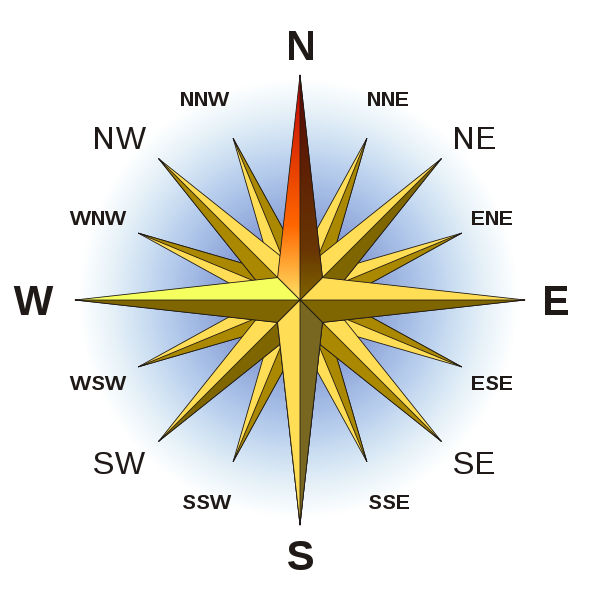 If you were using 8 compass points (North, northeast, East, Southeast, South, southwest, West, Northwest), add two axes at an angle of 45 degrees to the first two. Construct the bisectors to the angles of 45 degrees, when observations were conducted for 16 rhumbs. That is, if are taken into account and a more accurate direction (North-northeast, East-northeast, South-southwest, etc. ), there should be two more lines. Put all the already constructed 8-axis equal segments and connect them with lines. Find the middle of each of them through this point and the center of the picture draw a straight line. Turned four axes. Erase the auxiliary lines. Analyze observational data. Count the number of days the wind was blowing in each direction. It is possible that in this area the air masses come only with the sample of cardinal. This means that the rose of the winds is clearly expressed. Put on the drawn coordinate axes the results of your calculations in scale. As a rule, rose of the winds is drawn for a certain period of time: month, quarter, year. The longer the time interval, the smaller must be the scale. For example, if you build a chart for the month, then the unit can be accepted by the cell in 5 mm. If you do a annual schedule, a single day can mean one millimeter. Take another scale that fits your needs. Measure on each axis is the number of measurement units how many days the wind was blowing in this direction. Connect the marked points with lines. The resulting figure is the rose of the winds for a given location over a selected period of time. Light side, where stands the largest segment, characterizes the predominant direction of air masses. Advice 7 : What does the expression "wind rose"
Beautiful poetic expression "wind rose" is called a strict heraldic symbol-an octagon – the symbol of perfection and the desire for wonderful, romance of distant wanderings. And in fact is a rigorous mathematical diagram. The story of the birth of the sign "rose of the winds" goes far in depth of centuries. 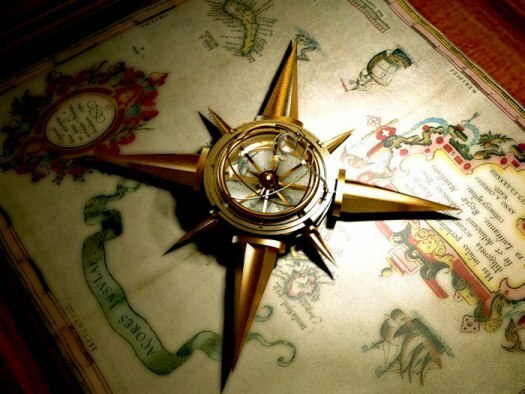 Initially it was the symbol of the navigation star the navigation. In the Northernhemisphere by such a fixed star in the night sky is the North star. The sailors long enough learned to determine latitude and roughly determine their location at sea. An ideal reference for experienced sailors was a breeze. After all, a constant sea winds at certain times of the year, and knowing these laws, the captain corrected its course and led unerringly to the ship from a long voyage to home port. So the character of the navigation star acquired additional importance, and starry rays began to point to the cardinal directions: North, South, East and West. Sign of the Rose, punctured at the shoulder, was a kind of amulet for sailors. He gave them confidence in the correctness of the route and a successful return to his native land. Today is a tattoo more symbol search paths – the guiding star. 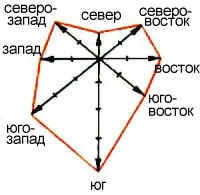 Inside the eight-pointed wind rose indicate the intermediate points northeast, Southeast, Northwest and southwest, the rays shorter. In addition to decorative value, the wind rose has a pure and applied nature that carries the necessary information. First of all, in one form or another wind rose used by meteorologists. On the orders of interested contractors, they build the vector diagram, which indicates the regime prevailing in a particular area of winds over a certain period of time – month, season, year, long-term value. Indeed, knowledge of the meteorological situation, trends and forces prevailing air flow is needed in many branches of economic activity and social construction. In the construction of airfields, it is necessary to choose the direction of the runways that was less "side-wind". In urban planning without rose does not do: it is necessary to consider where to place industrial enterprises, to coming out of their pipes waste is not carried by the wind into residential areas where to break the forest zone, how to Orient the main avenues to proskvozilo" the city of cold winds, or, conversely, to increase the "flow through" in the southern regions. In contrast to the symbol of the wind rose – diagrams of rays of different lengths, and their length depends on the frequency of days when the wind is blowing from this direction.